Nancy Noyes Silcox is a librarian who became an author unexpectedly. She was the first librarian at Samuel W. Tucker Elementary School in Alexandria, Virginia. There she learned how this young, African American lawyer organized a sit-in at the Alexandria Library Public Library in 1939 to challenge the library’s “whites only” policy. She knew someone needed to tell this story, and decided to do it herself when she retired. Samuel Wilbert Tucker: The Story of a Civil Rights Trailblazer and the 1939 Alexandria Library Sit-in is her first book for young readers and the only biography of Samuel Wilbert Tucker. Nancy grew up in a small town in rural Minnesota. Public libraries were always a big part of Nancy’s life. When she was very young, she participated in the summer reading program at the library. 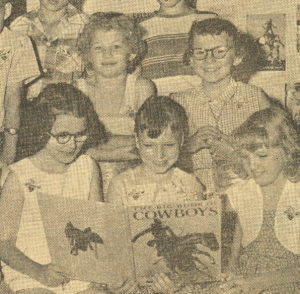 One summer, Nancy and her friends read over 100 books and got their picture in the newspaper. That’s Nancy in the center holding the book. Nancy Drew mysteries and the Laura Ingalls Wilder “Little House” books were her favorites. Both Nancy Drew and Laura Ingalls were strong, capable, resourceful girls who could take on any challenge. After high school, Nancy studied speech and theater arts at the University of Minnesota and loved being in plays. She also worked in the university library’s Rare Books Department. and found that she liked library work too. After college, she got married and joined the Peace Corps. For two years she and her husband were teaching in Guyana, South America. Returning to the U.S. she got her Master’s in Library Science from the University of Michigan and began her career with the Arlington (Virginia) Public Library. When her husband took a job in Egypt, Nancy followed, eventually working in international schools in Egypt, Jordan, Belgium and Ukraine. 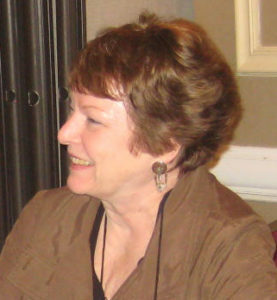 Moving back to the U.S., Nancy was a school librarian with Alexandria (Virginia) City Public Schools until she retired in 2011. When she’s not visiting schools or presenting at conferences, Nancy loves to travel, read, garden, go to plays, and cook fancy dinners for friends and family. She also keeps up-to-date with what’s happening in school libraries by teaching the School Library Media Practicum course at The Catholic University of America in Washington, DC.